Drink-drivers may not lose licences | What Car? Drink-drivers wouldn't automatically lose their licences if the Government goes ahead with plans to lower the alcohol limit for motorists to the equivalent of less than a pint of beer or glass of wine. Ministers are considering lowering the UK drink-drive limit to 50 milligrams of alcohol per 100 millilitres of blood from the existing 80mg limit. The Government will publish a consultation document on the matter in the next few weeks. Under the plans, those caught driving slightly over the new limit would get six penalty points for the first offence and only be disqualified from driving if they re-offended within five years. Anyone caught over the current 80mg limit would still be automatically banned. The proposals have met with a mixed response. Road safety groups fear that abolishing the automatic ban will send a confusing message to motorists and encourage some to risk drink-driving because the consequences of being caught would be less serious than they are now. However, the Government is concerned that if it maintains the automatic 12-month driving ban for breaching the drink-drive limit, thousands more drivers could lose their licences and therefore risk losing their jobs. The influential Parliamentary Advisory Council for Transport Safety said it was undecided about whether to support ending the automatic ban. In 2006, 540 people were killed in drink-drive crashes, up from a low of 460 in 1999. 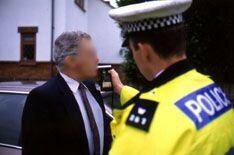 About 95,000 drivers a year are banned for at least 12 months for failing a breath test or refusing to be tested. Britain has the highest drink-drive limit of any large European country. Most countries have adopted 50mg and some, including Poland and Sweden, have a 20mg limit.